I know, I know, this post is super late! I spent a big chunk of September being sick- turns out I am allergic to my own house. So. Much. Fun. And then I spent the beginning of October in Belgium drinking beer. Poor me! *eyeroll* But here it is! And themed! HALLOWEEN IS HERE!! And I have all the excitement. All of it. It is absolutely my favourite holiday and quite a serious endeavor in my house. I’ve had my costume planned since January. The pumpkin has been carved. I’ve been working on my cross-stitch sampler for months and construction of the bat wall is right on schedule. The rest of my decorations are making their way out of storage and I’ve been scouring Pinterest to find more hellish crafts to create – poison bottles anyone? Bring on the ghouls. But one of my favourite parts of this time of the year is the requisite binge viewing of Hocus Pocus. Because witches. Witches (or, I should say, witch stereotypes) are an unquestionably essential part of the Halloween season. In fact, the black-hat-wearing, broom-riding, cat-loving witch is ubiquitous in modern western culture. Appearing in everything from famous movies to children’s costumes, they have been a subject of fascination for decades. Recently the History Channel launched a video that appeared to claim that our modern pop culture depictions of witches were rooted in the garb and tools of alewives, and that this creation came about in the 16th century. From the pointed hat to the black feline companion, its brewsters, they claim, that are the cause of this portrayal. There is only one problem. These arguments aren’t historically accurate. At all. Hello, my name is Christina, Crusher of Myths, and today I’m here to refute the idea that modern pop culture depictions of witches are rooted in the dress and culture of either medieval, or 16th century, alewives. Grab some candy corn and get comfortable – this is going to be a long one. One of the key premises of the argument that medieval, or 16th century, alewives= witches seems to be predicated on the idea that these alewives wore tall hats to get attention at the market and these tall hats were what led to the portrayals of witches in similar garb. Leaving aside the (false) concept of some pan-European medieval millinery for alewives, the introduction of the pointy-hat clad witch seems to have surfaced the 18th century in children’s chapbooks (a pamphlet of tales). For example this woodcut from an 18th century work depicted Mother Shipton, an alleged witch. This is from Chap-Books of the Eighteenth Century by John Ashton and it’s a fascinating book. Do have a gander at some of the woodcuts, you will not be disappointed. Another awesome source for similar images is The History of Witches and Wizards: Giving a True Account of All Their Tryals in England, Scotland, Sweedland, France, and New England … Collected … By W. P. There are varying dates for this with some suggesting 1720, others 1760. You can get the free ebook from Google and brush up on your knowledge on medieval and early modern witchcraft trials, with a heavy dose of 18th century bias. So, you know, just a tiny bit biased. Tiny, tiny bit. Francisco de Goya, Witches Flight, 1797-1798. But this iconography displayed on these images wasn’t the only or even the most dominant depictions of this era. For example, Goya depicted pointed hats a little bit differently on a group of male witches. Prior to the introduction and widespread use of the pointed hat, witches were generally depicted naked and bareheaded, or in historically and contextually accurate and appropriate garb up through the early modern period during the peak of the witchcraft persecutions. Anonymous Miniature of Witches Being Executed, 14th Century. Held in collection at the British Library. Pamphlet depicting witches from Northhampton dating to 1612. They might be drawing upon classical depictions the goddess Diana who was associated throughout these eras with witchcraft. Francisco de Goya, The Inquisition Tribunal, 1812-1819. A perhaps more plausible contention comes from the lauded scholar Peter Burke, who postulated in his Eyewitnessing: The Use of Images as Historical Evidence, that the witches hat, and indeed the portrayal of the witch with a hooked nose, stem from virulent anti-Semitism. He described the portrayal of the witch as absorbing and amalgamating with contemporary depictions of Jewish people as the ‘migration of stereotypes’. Burke cited a decree Buda, Hungary from 1421 declaring that all those arrested for sorcery must wear tall pointed hats and in early modern Spain, heretics were also required to wear similar garb, he referred to this as ‘visual code expressive of sub-humanity’. Another convincing argument is that it stemmed from everyday hats. I would like to introduce you to the capotain and phrygian hats. Popularized in late 16th and 17th centuries these hats were often depicted adorning the heads of wealthy or noble European women, but also men. This hat was associated with Puritan costume in the years leading up to the English Civil war and the age of the commonwealth. Usually hats in these portraits had flat, rather than pointed tops. But some certainly were pointed like this pièce de résistance currently in collection at the Tate. And as for alewives, I have previously written about the general portrayals of alewives in art and literature. In the later Middle Ages, when the witch-hunt began in some earnest, alewives were often depicted naked and bareheaded or with the devils snare, a two pronged headpiece common in the period, and associated with vanity, at the time. Think Maleficent. It was a type of hennin, though this one in particular was looked down on by the church (shocking) as it was associated with forms of vanity. So, this in and of itself, overturns this whole argument that the garb of medieval, or 16th century, alewives created our modern depictions of witches. Clearly the hats and association with witchcraft didn’t appear until much later. But for fun, let’s dig a little deeper into two of the other supposed links: brooms and cats. A second point of this argument is that the broomsticks that witches rode come from the alewives alestake – a pole of some sorts, commonly with a garland or bush attached signaling ale for sale. False. To begin with, witches are portrayed as riding actual brooms, as well as all manner of sticks, staffs, shovels and even tridents and pitchforks. Sure, an alestake might qualify as a stick or staff but I have yet to find references to alestakes specifically as a flying device for witches in any of the medieval or early modern primary sources I’ve been investigating. They are also often depicted riding animals, for example in the 1613 painting by Pierre de Lancre- Tableau de L’inconstance des mauvais anges et demons. This might have been modeled after the followers of Diana – more on that in a minute. Sometimes witches even flew without the need of any kind of instrument at all, simply the devil-powered wind. In the 1324 trial of Alice Kyeteler in the city of Kilkenny in Ireland, the prosecution stated that, ‘in rifeling through the closest of the ladie [i.e. Alice}, they found a pipe of oynment, wherewith she greased a staffe, upon which she ambled and galloped through thick and thin’. And in the Salem witch trials of 1692-1693, both Mary Lacy and Martha Carrier used sticks to get to their witches Sabbaths. 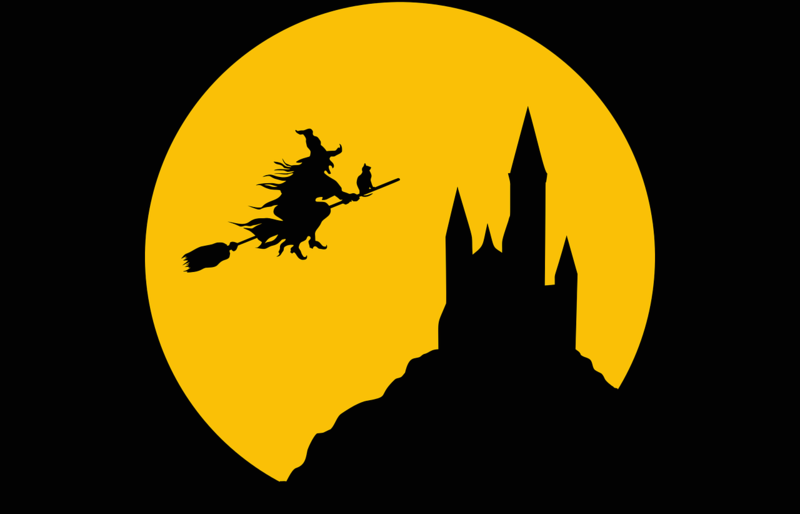 While the broomstick is the most popular item in our modern society in which witches are depicted on their flights, this was clearly not the case for vast swathes of history. For example, Rosemary Guiley’s research concluded that no brooms were ever mentioned in the English trials and that the beliefs that witches travelled via broom were much more prevalent in the continental European records. Again, this stresses the point that witches were not depicted the same throughout Europe. The belief that witches could actually fly was typically denounced in medieval thought, instead they thought this was a hallucination brought about by the devil. An example of this can be found in the Corrector of Burchard of Worms, the Bishop of Worms in the Holy Roman Empire, dating to 1008-1012. And this is also reflected in what is perhaps the most famous of all witch writings, the 1487 Malleus Maleficarum, or Hammer of the Witches, which viewed metamorphosis as a demonic illusion: ‘Therefore it is evident the demons cannot actually effect any permanent transformation in human bodies; that is to say, no real metamorphosis’. So why the broom? As Brian Levack argued, the broomstick was associated with women and its use ‘might therefore reflect nothing more than the preponderance of female witches’. Perhaps it was a symbol used merely to reflect the amount of female witches and something they would have easy access to in their daily lives. And where did the concept of flying women originate? The idea of the witch as a night flyer occurred as the result of amalgamation of several strands of folklore as well as a ecclesiastical conception that emerged in the late 12th and early 13th centuries when monks created a hegemonic image of the heretic as a ‘secret, nocturnal, sexually promiscuous devil-worshipper’. This would fuse with two distinct concepts in existence in Europe for a long time. The first of which is the strigae, which dates to the classical period. The legend here is that women transformed into flying screech owls at night and devoured infants. They were also known as lamiae, a Latin word for witches. The second strand is the women who would leave their homes at night to follow Dianna on the Wild Hunt aka “Ladies of the Night’. Beliefs in both these concepts was so powerful among the commoners that some women swore that they actually engaged in these practices. Until the 14th century, most of the scholarly elite did not believe these claims, instead arguing that these were delusions of the Devil, as I talked about earlier. However, this would come to change as all of these ideas fused, and these supposed illusions became reality. And, perhaps most importantly for our purposes, it well predates the demonization of the alewife in art and literature. One of the earliest mentions is in an anonymous 13th century poem from Tirol stating, ‘Indeed, he adds, it would be a wondrous thing to see a woman riding a calf, or a broomstick, or a poker, over mountains and villages’. So again, the association of broom and witchcraft has naught to do with alewives. Now we are going to turn to the fluffy, adorable little…Minions of Satan? Cats had ties to heretics in the medieval period and there are extensive sources for this. However, they only rarely were linked with witchcraft in the Middle Ages. For example, they were commonly associated with the devil. Kathleen Walker-Meikle cites an example of the 12th century French Theologian Alan de Lille who ‘claimed the very name Cathars came from cats and that they worshipped a black cat, the devil in disguise, and would kiss its bottom during service’. *Shudder* Of course this understanding of the Cathars was largely rubbish, propaganda designed to frighten and horrify the general population about a heretical threat. And it wasn’t limited to this group- the Knights Templar got a similar treatment during the course of their trial in the Middle Ages where they were accused of worshipping a cat. Walker-Meikle contended that the association with cats and heresy (and eventually witchcraft in the early modern period) has to do with their being both domestic and wild. An inherently disloyal animal owing to its natural instincts. This is highlighted in the writings of Hildegarde von Bingen who referred to them as unfaithful and Chaucer’s Manciples Tale (from his famous 14th century story collection, The Canterbury Tales) where the cat is depicted as one who could have the most luxurious of trappings but would still abandon its owner to chase a mouse. But this didn’t seem to necessarily deter people from keeping them as pets. The accounts from medieval and early modern periods are quite clear that people were certainly keeping cats as companions. And pet keeping was not necessarily a rare thing and the range of animals kept as pets was broad in this period from dogs, apes, squirrels to singing birds. ‘attacks on female pet-keeping implied a number of things: without a firm (male) hand the woman would make such a mental descent that she would disregard the differences between the species and show herself to be close to the beast; that she might, perhaps even more subversively, misrecognize the role of the man to such an extent that an animal is felt to be able to fill his place; and that, instead of reclaiming perfection, she would re-enact Eve’s temptation by the Devil and make the animals not merely wild, but satanic’. In short, women and pets were thought by some to be a particularly dangerous combination. So much so that women could easily mistake their pets for their husbands. I cannot eyeroll hard enough at this. So much misogyny. It is important to recall that neither medieval nor early modern Europe were a monolith. Different cities, countries and regions, across various time periods, could have differing relationships with the felines. This is not to even delve into the various relationships of individuals with their animal companions. For example in early medieval Ireland cats could have quite a high value. According to the early medieval law tract catslechtae, or cat sections, a cat was valued at three cows if it could hunt mice. A further example is the feline Martino, cat-son of Isabelle D’Este’s, who died in 1510. Upon his demise he was greatly mourned and treated to a lavish funeral held by De’Este’s courtier Mario Equicola, who even held a graveside sermon. However, while in the Middle Ages cats were associated with heresy, it was in the Early Modern period where cats also started being linked with witchcraft and were referred in tandem with witches and demonologies. But the concept of familiars, so common in our modern witchcraft depictions, were almost entirely unique to England.According to Walker-Meikle, the earliest case of familiar at an English witch trial occurred in 1556 with the case of Elizabeth Francis in Chelmsford where she was accused of ‘keeping the company of a large white spotted cat she called Satan, her familiar’. And familiars weren’t just cats. The animals who were accused of being familiars were often just the pets of the accused. These ran the gamete: cats, dogs, toads and bats. It wasn’t just as familiars that cats came to be associated with witches, indeed it was believed that the witches themselves could transform into any of these various animals. This concept of metamorphosis was more common throughout continental Europe and beyond. For example, a 1652 pamphlet stated that Joan Peterson bewitched a child and rocked the cradle in the likeness of a cat. And Anne Bodenham, in 1653 pamphlet, was apparently turning into a cat, a mastiff, a black lion, a white bear, a wolf, a horse, a bull and a calf. So, to sum up the history of cats and witchcraft, which has been extremely briefly discussed here. Cats were long associated with evil and heresy. When the heretical trials gave way to witchcraft cases so too did the felines come to be associated with witchcraft. This was not related to alewives keeping cats to catch mice from their grain, but instead a long standing, deep-seated distrust and association of this particularly animal with the occult and demonic forces. TL;DR: Medieval or 16th century alewives were not the cause of the modern witch stereotype, which seems to have solidified in children’s chapbooks from the 18th century. Seriously though, be wary of all your reading material. Do your own research and hold your favourites accountable. We can all get it wrong sometimes. Catherine Rider, Magic and Religion in Medieval England, (London, 2013), p. 213. Gary Jensen, The Path of the Devil: Early Modern Witch Hunts, (Lanham, 2007), p. 3. Rosemary Guiley, The Encyclopedia of Witches, Witchcraft and Wicca, (New York, 2008), p. 396. While not written by an academic, Guiley has compiled a broad range of sources here that has proved useful. Rosemary Guiley, Witches, p. 396. Peter Burke, Eyewitnessing: The Use of Images as Historical Evidence, (Cornell, 2000), p. 136. Brian Levack, The Witch-hunt in Early Modern Europe, (Harlow, 2006), p. 49. If you have one- send it on! J. Mann, Murder, Magic and Medicine, (Oxford, 2000), p. 84. Burchard of Worms, ‘Decretorum Liber Decimus Nonsus’ in John Shinners (ed. and trans.) Medieval Popular Religion 1000-1500: A Reader (2nd Edition: Toronto, 1997), p. 443-444. Heinrich Kramer and James Sprenger, Malleus Maleficarum, (trans. and intro.) Montague Summers, (New York, 1984), pp.1-2. Norman Cohn, Europe’s Inner Demons: The Demonization of Christians In Medieval Christendom (London, 1993), p. 166. Irina Metzer, https://irinametzler.org/2013/10/10/witchcraft-and-cats-in-the-middle-ages-revisited/ Accessed 23/09/2017. Walker-Meikle, Medieval Pets, p. 13. Malcolm Barber, The Trial of the Templars, (Cambridge, 1978), p. 178. Erica Fudge, Perceiving Animals: Humans and Beasts in Early Modern English Culture, (Basingstoke, 2000), p. 133. Fudge, Perceiving Animals, p.134. She also argued that the sexualization of the relationship between animals and humans was not limited to women, e.g. Men and Hawks, but here the hawk is presented as a female entity whereas the man is dominant and in control ergo it is not a problem (Fudge, 134-135). Charlotte-Rose Miller, Witchcraft, the Devil, and Emotions in Early Modern England, (London, 2017), p.71. Very in depth and insightful, just the sort of thing I like to read this time of year 🙂 A lot of the accused witches lived in rural areas, and so their houses were naturally open to wandering cats, toads, rats and spiders, so when they were accused of harbouring devilish imps in disguise, the evidence was totally against them!